At the Youth Garden Project, we are committed to growing organic fruits and veggies and connecting the community to the growing process from seed to table. You can help us achieve this goal by volunteering! We welcome community members and visitors of all ages to get involved at the YGP. Volunteers are crucial to our organization. Learn more about how you can be involved below. 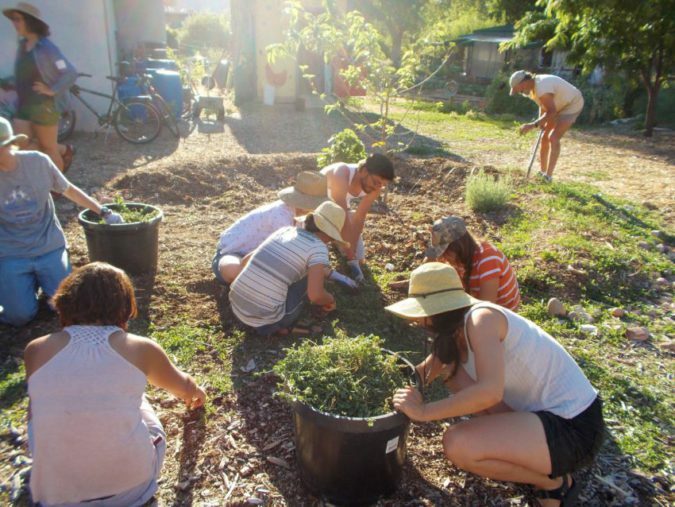 Do you have a hand to lend and want to help out at the Youth Garden Project? Our volunteers contribute vitally to many aspects of YGP’s daily functions. Whether you want to help out one time, every once in a while, or can commit to a regular schedule, we want to hear from you! The nature of our work is seasonal, so each week something new and exciting is going on. We do much more than farm work and there is a place for everyone on our volunteer team. We are more than happy to discuss how our collaboration can meet both of our needs! 8-11am May-October (harvesting and washing produce for our CSA and produce stand) – Must sign up/contact YGP ahead of time. 8-11am (weeding, turning compost, planting, bed prep, kitchen and office tasks, painting, garden structure, and classroom maintenance) – Must sign up/contact YGP ahead of time. Every other Wednesday evening come weed and we will cook a delicious meal for you in return 6-9pm (see here for more info) – No RSVP needed! We welcome volunteers who can commit volunteering during times that fall outside of these hours! Please contact us for more information. We are happy to provide a space for those to complete their mandatory hours. Please give us a call to arrange. YGP loves working with service groups from around the country! Give us a call to talking about getting scheduled and how we can incorporate you into the work we have going on at the garden!